Grimm’s fairy tales are everywhere I read these days. In reviewing Toni Morrison’s new book God Help the Child for the New York Times, Kara Walker identified this as a child abuse story – “a brisk modern-day fairy tale with shades of the Brothers Grimm…hungering for warmth.” Alexandra Alter mentioned a Grimm story for older children – Adam Gidwitz’s A Tale Dark and Grimm – in her article about children’s book editor Julie Strauss-Gabel (The Barbed Pen of Best Sellers).” Gidwitz’s first book, thanks to the clever editing of Strauss-Gabel, was named a 2010 Best Children’s Book by Publishers Weekly and School Library Journal, and the book was followed by two more in the trilogy. Although Gidwitz’s dark and scary tale is written for middle schoolers, like many children’s books, adults can find an abundance of relatable material. The theme of parenting – mostly bad parenting – is the focus for following Hansel and Gretel through a series of original and incredibly violent Grimm fairy tales. The action is gruesome and scary, punctuated by the author’s sly teasing to turn away before the next horrible event – meant to goad readers to keep reading, of course. Lessons are learned about the meaning of finding yourself, finding your home, and finding forgiveness. Hansel and Gretel are beheaded; fingers are cut off; girls are dismembered, and more…but all is well in the end – a fairy tale ending? If you have not found this gem – and don’t mind a little blood and guts – read it with your favorite middle schooler – or alone at night when the wind is howling. 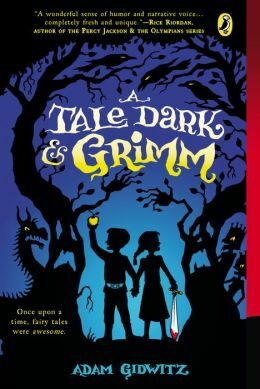 This entry was posted in authors, book review, books, children's books, children's literature, reading and tagged A Tale Dark and Grimm, Adam Gidwitz, American Library Association, children's authors, children's book editors, Fairy tale, Grimm fairy tales, Grimm tales, Hansel and Gretel, Julie Strauss-Gabel, Kara Walker, Toni Morrison. Bookmark the permalink.